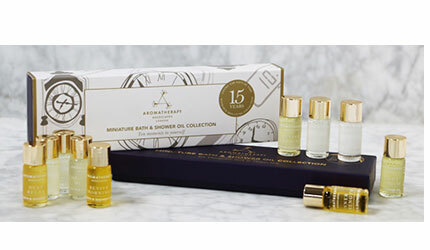 To celebrate the 15th anniversary of the Miniature Bath & Shower Oil Collection we are treating you to the gift of time with the limited edition of our most loved product. We strongly believe in the importance of celebrating you and taking time out of your day to relax, reflect and find balance which is why we are giving you 200 minutes to indulge and experience our 10 essential oil blends. Each unique oil has a solution and can affect your sense of wellbeing for up to 6-8 hours. Whether you struggle to fall asleep at night or wake up in the morning, just need to unwind or looking for an emotional uplift, there is an oil for every need. Going on a holiday? Whether you’re going for a stress free beach holiday or back-packing across the world, there is a blend to suit your mood and set you for the day. The miniature collection is the perfect essential travel size products to take with you to experience the benefits of aromatherapy even when on the go. Consider each powerful little bottle a permission to take 20 minutes of precious time for yourself to rebalance your mind and body wherever you are. The new Miniature Bath & Shower Oil Collection also makes the perfect gift for a loved one to extend and share that moment for any occasion or difficult times ahead. Experience the ultimate therapeutic splendor with this special edition of the multi – award winning Miniature Bath & shower Collection and share with us your favourite blend on Twitter!